Can you please tell us more about your gaming experience? It seems like you’ve moved from one very immersive intense world of creation to another! I started programming video games in 1980 and along with my partner, Jason Rubin, founded Naughty Dog, Inc. in 1985. We ran the company for almost twenty years and I designed/co-directed/produced thirteen games, including the best selling and award winning Crash Bandicoot and Jak & Daxter franchises. What were your reasons for turning to writing full time? Was it a difficult transition? And the thing about making games is that you can no longer do it mostly by yourself. These days, most games are big teams of over a hundred people, with budgets over 50 million dollars. It’s no longer about your creative expression (most of the time), but about getting it done well, on time, and on budget. And the roll of team lead is largely about fire fighting and resource (achem: people) wrangling. Are there skills from your ‘former’ life that have served you well as a full time writer? Are there things that have made it difficult to adjust? As a serial creator (having made over a dozen major video games), it was interesting how similar the process was to any other complex creative project. Video games and novel writing are both very iterative and detail oriented. They use a lot of the same mental muscles. The most difficult thing to adjust to was how ‘old fashioned’ and slow the publishing business is. In the video games industry, most people are highly computerized and expect very rapid turnaround. In the 90s I used to send employees to the airport at 5am to fly copies of games to remote offices because Fedex overnight was ‘too slow.’ A few years later we had installed a special high-speed internet connection between LA and San Francisco so we could just upload any time of day. Our games would be on sale sometimes as little as two weeks after we finished them. In publishing, some people still use snail mail, multi-month response times are the norm, books take two or more years to hit the shelf, etc. This is a vestige of antiquated business practices stuck in the 1950s and shows a lack of genuine competition. Publishers don’t really compete with each other, but Amazon has no such scruples, which I think is a very good thing. Right now (as of early May) it’s out on submission to New York and London publisher’s via my agent, Eddie Schneider of JABberwocky. I’m very interested to see what the publishers have to say about it and if they can make an offer that is overall more compelling than publishing it myself. What words of advice would you have for anyone considering taking the plunge and writing full time? Read, read, write, write, edit, edit, edit. And hire good professional help too. Friends and family can give you a sense of how the book reads, but they can’t usually tell you how to fix anything serious. I’ve read a lot of half-decent Indie books on my Kindle that are at their core good, but just need some serious tightening and polish. Hell, I’ve read plenty of big-six bestsellers you can say this about. Since I’ve created thirteen video games and written two novels I’m often asked how the process compares between the two. This is a complex topic, but here goes one stab at it, focusing on the generation of the idea. Both games and novels start with a basic idea, and it’s essential to focus on what’s important. In both cases, this is a creative process, imagining something blurry and only partially formed that calls out to you. Games are about gameplay, so this is then a question of gameplay genre. Not the Horror vs Mystery type of genre, but what kind of game is it. Generally you start with one of the proven gameplay types: Platformer, shooter, driving game, sports game, etc and then try to bring something new to the table. For Crash Bandicoot, this was “character platform game in the vein of Donkey Kong Country, but in full 3D” (there were no 3D platform games when we started). With novels, the core idea is also genre, but the meaning of this is different. 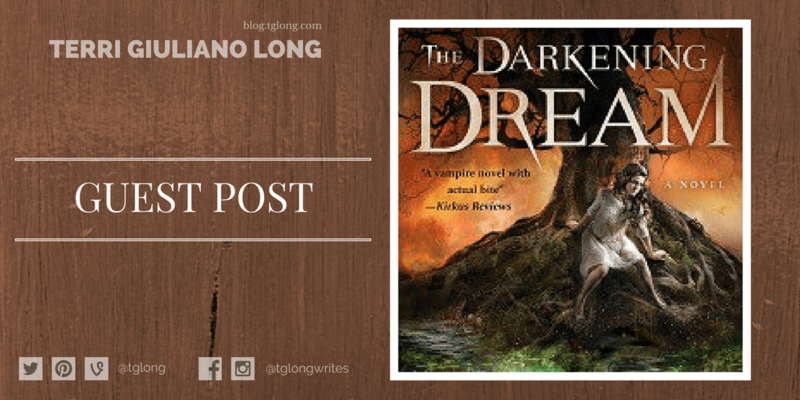 In starting The Darkening Dream, I had this image come into my head – and some might consider me disturbed – of a dead tree silhouetted against an orange sky, a naked body bound to it, disemboweled, and bleeding out. The sound of a colossal horn or gong blares. The blood glistens black in the sunset light. Bats circle the sky and wolves bay in the distance. But sacrifice isn’t just about killing. It’s a contract. Someone is bargaining with the gods. Complex ideas are the intersection of multiple smaller ideas. To this I brought a desire to reinvent the classic Buffyesque story of “a group of teens fight for their lives against a bunch of supernatural baddies trying to destroy the world.” But the twist is that I wanted to ground all of the magic and supernatural in “real” researched historical occult. This defined the book as a kind of supernatural thriller from the get go. Part 1 gives you a core, or germ, of the project, but to start moving with it you need setting. Again, looking at The Darkening Dream I had this disturbing image in mind. This was a vampire moment, but not exactly your typical one. For years, I’d been noodling on my own private vampire mythos, grounded in a kind of religio-historical thinking. 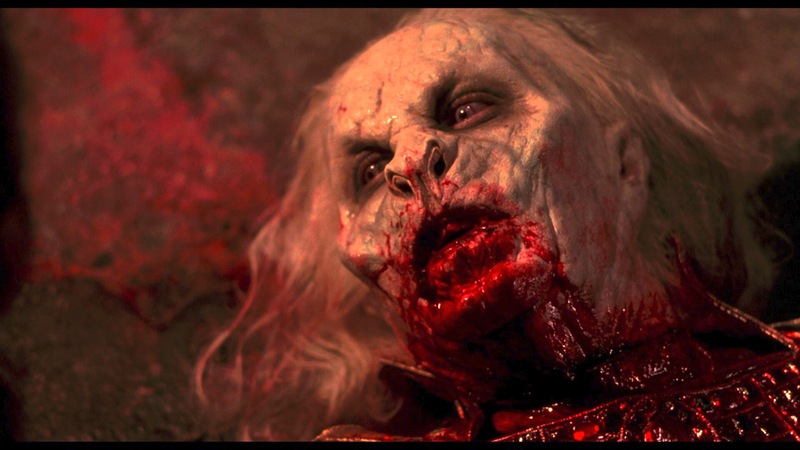 Coppola’s Dracula, for example, has Vlad’s dark power grounded in rage and the Christian god forsworn. But I liked the idea that the most ancient of vampires was far older than Christ, perhaps older than civilization itself. This got me thinking about Neolithic religion. Pre-civilized peoples were essentially shamanistic. The shaman (sometimes called a Witch Doctor) interfaces between the people and hidden powers, both wondrous and terrible. What if one of these men, millennia ago, struck a dark bargain: blood for life. And so was born the idea of the vampire blood gods, dark deities of old forests, of sacrifices bleeding on trees, of gnashy gnashy teeth, slick with blood. This held the key to a ancient vampire explanation grounded in belief. Gods created and fed on faith, instead of the other way around. And the blood gods are not alone. Other ancient gods might still linger, diminished, but still powerful. There seemed a natural synergy between their fate and the syncretistic quality of human religion. As the belief changes, so does the object of said belief. This meta-idea is very complex, a kind of world setting rooted in history, but reaching back to basics, novels are fundamentally about protagonist and the drama generated by the obstruction of their desire by opposing forces (often antagonist). I tend to think of the antagonists first, but this is a little backward. I knew I wanted a teenage girl, mostly for reasons of contrast with these sinister villains. She too, should be a dabbler in some school of occult-religious power. I like the idea of magic involving hard work and study, call it bookworm power, so I conceived of this studious girl, kind of an older Hermione Granger, daughter of a scholar father with a hidden past. As a heroine, she seeks to use her growing skills to “do the right thing” but all such power if fraught with danger, and her naivety gets her in way over her head. This magical-religious thinking lead me to a conflict between the old (superstitious?) way of thinking and the modern (technological?) world. I was drawn to a number of cusp points, but settled on the eve of World War I. That war changed the human political landscape, completing the process of casting down King and Church that had been ongoing since the Reformation. It also provided an era with significant room for sequels (WWI, WWII, cold war, etc.) and a freedom from cheap plotting shortcuts like mobile phones and the internet. With Crash Bandicoot, the notion of setting was much simpler, but no less important. Back in 1994 when we were visualizing our 3D platform game we wanted to follow in the tradition of using a quasi-animal character. Various factors led us to a sort of Looney Tunes style character design and world. In the early 90s, voice for video game characters was technologically dicey and tended to be cheesy, so we thought to convey strong personality through animation. We also liked the idea of taking a real animal that had a distinct name, yet one rare enough that few people knew what it looked like. In this way, we hoped to “hijack” the animals name and have our character become representative of this real animal. This quest for a cute, well named, and rare animal led us to the Bandicoot, and hence to an isolated island setting full of exotic animals. In the cartoon space it seemed natural for the villain to be an evil genius, misunderstood, surrounded by idiot minions that bungle his brilliant plans :-). Doctor Neo Cortex was born. Since normal rodents are a bit mousy, and not necessarily that cool, we gave him the Evolve-O-Ray program in which he was “enhancing” the animal life of his island. Crash took form as the goofy “bungled” product of these experiments, fighting, in his goofy way, to protect the natural world from this renegade scientific program. Once you work out the basic creative concept for a big project, the rest of the ideas tend to flow outward from these first principles. In world of The Darkening Dream I drew on historical and religious settings, people, magics, and sects to provide allies and enemies, creating their motivations out of their own peculiar frameworks. With Crash, the cartoon style of the world and the practical needs of the platform game drove decisions. Platform games (and many other game types) have Bosses and Sub-bosses. If Neo Cortex is the boss, then he needed henchmen (mutated animals and lab assistants) and middle management (the various Sub-boss animals). His island needed varied settings (read variety), but it was a jungle island, so this led us to island-compatible settings like beach, jungle, caves, etc. Andy Gavin is an unstoppable storyteller who studied for his Ph.D. at M.I.T. and founded video game developer Naughty Dog, Inc. at the age of fifteen, serving as co-president for two decades. There he created, produced, and directed over a dozen video games, including the award winning and best selling Crash Bandicoot and Jak & Daxter franchises, selling over 40 million units worldwide. He sleeps little, reads novels and histories, watches media obsessively, travels, and of course, writes. Find out more here, and follow Andy on Twitter and Facebook. This week, through June 29th, Author Andy Gavin is running a big giveaway to celebrate his 99 cent promo sale.